I've been busy doing a whole bunch of things other than my usual sewing projects for the last few weeks. 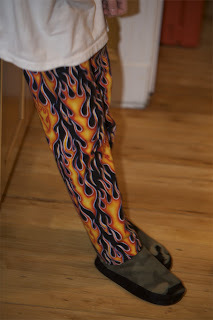 I did make a second doggie sweater, but then I was on to a baby hat, and these...some flame pajama pants for my step-son Schuyler. We had been in JoAnn and he saw the flame fabric and his eyes just lit up "what could we make with THIS?" he said. So pajama pants it was. When I went back to buy the fabric, the woman at the cutting counter said "you must have a son, that's the only people who like this!" Pretty funny, but he loves them, so I guess that means they're perfect!